Bollards are increasingly used to help protect a variety of things such as: damage to buildings from accidental collisions, the allocation of car parking spaces, to prevent ram-raiding and to hinder vehicle-based terrorist actions such as the 2007 Glasgow International Airport attack. Bollards are useful in mixed-use public spaces, which support both pedestrian use and emergency or service vehicle use. 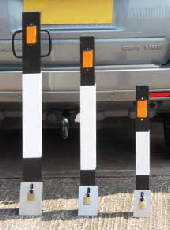 Bollards costs vary greatly depending on their purpose and ability to resist ramming vehicles, with the most expensive bollards being able to stop vehicles at speeds of 50 mph (80 km/h). Can be lowered entirely below the road surface (generally using an electric or hydraulic mechanism) to enable traffic to pass or raised to block traffic. 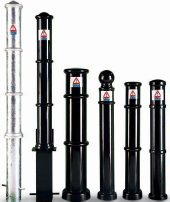 Rising bollards are used to secure sensitive areas from attack or to enforce traffic rules that are time related or to restrict access to particular classes of traffic. Are fitted into a permanent metal ground socket, from which they can be removed entirely to allow traffic to pass or when not required. Generally lowered by a key mechanism, are found useful in cases where it is difficult to install any electrical or hydraulic systems. Are hinged at ground level, allowing them to be folded flat to permit vehicles to drive over them, are useful to control the allocation of car parking spaces.